It is no secret that India has given us stage fright. We’ve learned quickly that any sort of personal space or blending in with the masses is far from realistic. Over the last two years we’ve grown accustomed to being foreigners, but now for the first time we feel like E.T. Chennai was a serious eye opener. It was a crazy concoction of everything beautiful and ugly in the world and a transition took place in me while we were there. The most peculiar things seemed normal after two weeks; men who slept in their rickshaws at night, cows sleeping in the street, random nighttime parades, women in burkhas, the stares, Hindu rituals, and the segregation of men and women. Chennai was alive and real and there was no denying its hypnotizing energy. Yet the city was draining my energy and I knew it was time when our hotel’s elevator became my secret closet. It was a partially manual elevator and once inside the cage I’d close the double set of metal caged doors, press “3” and then relish in my seven seconds of bliss. Indian tunes would begin mid-song and a blast of cold air would explode from the ceiling fan, temporarily extinguishing the feeling that I was being baked alive. When departure day finally did come I was a twist of emotions; excited yes, but hesitant too. Was I really ready for this? It had been almost two months since we had done any real overlanding and it all kind of felt foreign to me. We exited the port’s gates at three in the afternoon. It was far too late to begin our first drive in India but the fact of the matter was we weren’t going back to Chennai. Absolutely no way. A few hours later we found ourselves at the police station in Mahabalipuram. “Here goes nothing,” Brad said, and then disappeared into the station while I patrolled Nacho. I felt at peace. The streets were pleasantly quiet and no one had discovered us yet. I relived the day’s events as Brad worked his magic. The police man pondered what to do and then picked up his phone and placed a call. After a few minutes he hung up the receiver and addressed Brad. 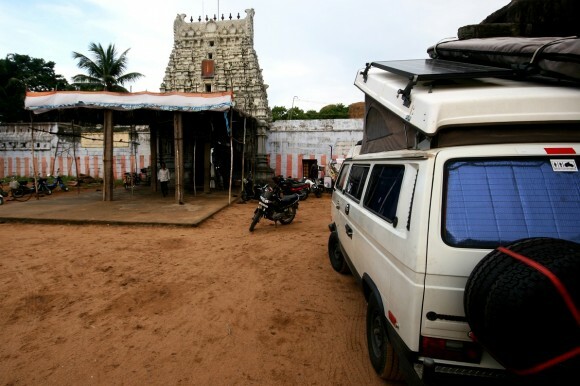 We only had to venture a few minutes to find the 600 year old temple, and Santhanam was waiting for us outside. 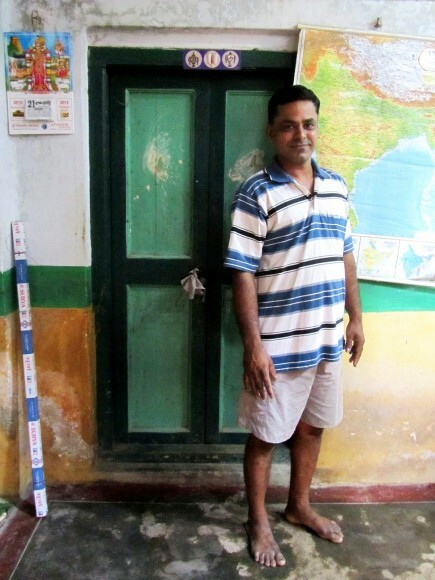 I liked him instantly and after two weeks in India he felt like our first real contact. He looked at us with curious eyes but not like we were aliens. We followed him inside and he led us to the shrine of Lord Vishnu where we were greeted by Gopal Krishna, the temple priest. He looked like an exotic character on the History Channel. He wore a white lungi and decorated his forehead with a series of painted lines—a red one down the center and two surrounding white lines that merged at the ridge of his nose. We talked with him for some time and I liked him just as much as Santhanam. “Welcome to India Sheena and Brad,” he said, and then dipped his finger in a red paste and marked our foreheads with tikka dots. On our way out I stopped to listen to two men play their trumpets in the temple’s inner courtyard. Their melody echoed through the building and instantly brought me back to the Indian wedding we stumbled upon in Kuala Lumpur, Malayasia. It was the same song. We parked Nacho in the vast temple courtyard, surrounded by the ancient buildings. During the first night, I awoke and peered out of the pop top window. Surrounding the van, visible in the full moon’s light, were dozens of cows sleeping around Nacho. They were the town’s cows, which plied the city streets by day dining on anything remotely edible and wreaking havoc with traffic. At night, this was their peaceful domain. Sleeping at the epicenter of a sea of cows under a full moon was surreal, although in the morning we noticed that one of them had eaten the corner of our bamboo mat, which took away a bit of the appreciation. 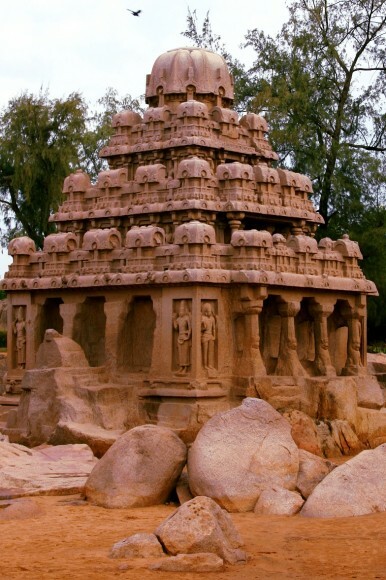 I learned quickly that Mahabalipuram is not some secret tourist destination, it‘s a World Heritage Site and with good reason. 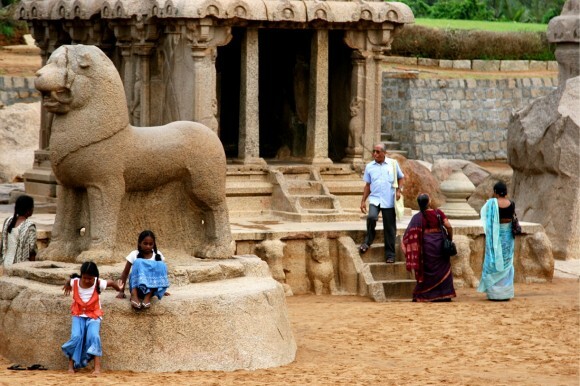 According to inscriptions, the monuments found here are the sculptural legacy left behind by Pallava kings Mahendravarman I (580 – 630 AD), his sons and their descendants. The King was a patron of fine arts and the area served as a leading port in ancient times. 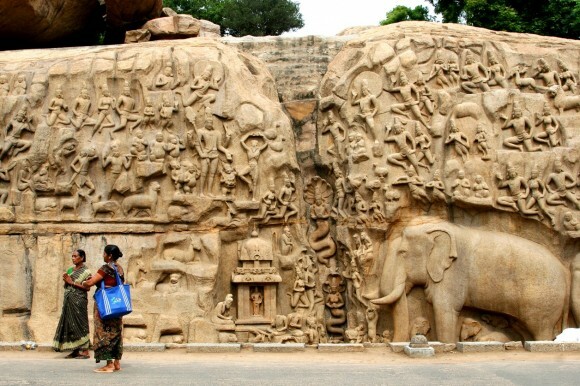 Just outside the temple we stood face to face with the world’s largest bas relief etched into the side of a boulder. 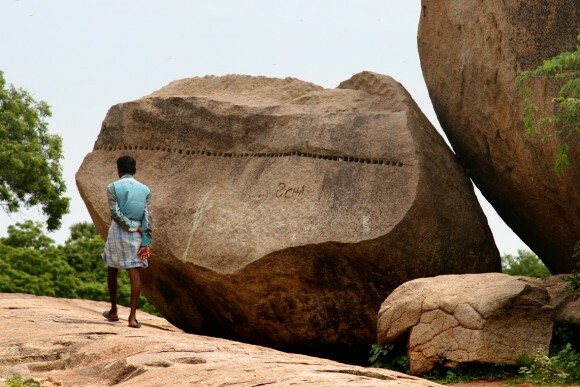 It depicted a scene of Hindu mythology that springs to life during the rainy season when the cleft in the rock, representing the Ganges River, flows with water and drains into a tank at the boulder’s base. 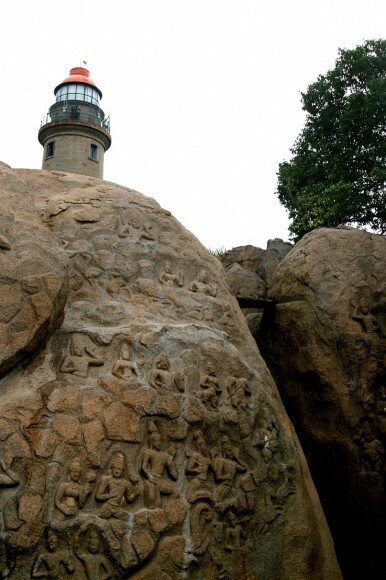 All over the hillside were other boulders scraped and sculpted into shrines and caves and stone columns, and their walls too were covered in stories of Hindu mythology. It was spectacular. A man followed us through the ruins. “To your right is the world’s largest bas relief.” Brad and I exchanged looks and then cut him off. “Sorry but we don’t want a tour guide.” He seemed hurt. “No we aren’t shopping. We just want to walk.” The rock seller left, but was almost immediately replaced by another rock seller, and then another. 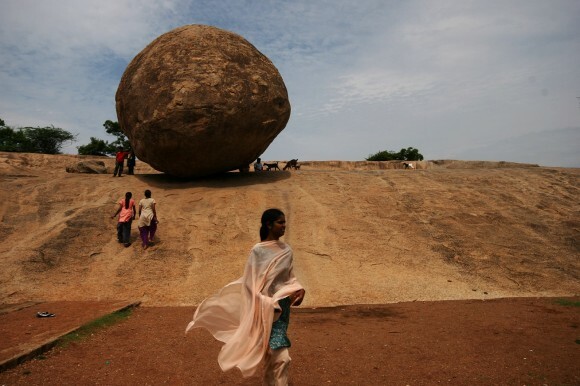 At the top of a ridge which sloped downward into a grassy field we came to another interesting site—“Krishna’s Butter Ball”—a comical name for a giant boulder, precariously balanced on the edge of the hillside. 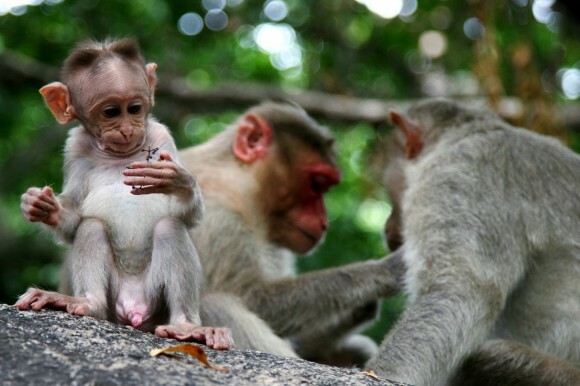 We retreated into the maze of boulders where billy goats hopped carelessly on the sides of boulders while scores of monkeys headed to their daytime hideouts. We explored more and hid under a tree as the weather changed instantly to a downpour of rain. We walked to the beach, drank coconut water, and finally walked back to Nacho. On the other side of the van a homeless family had set up camp for the day. 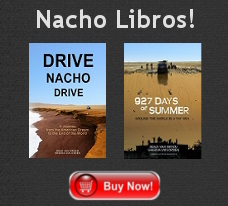 The children bombarded us before we had time to retreat into Nacho. They held their palms upward and pinched their fingers together. We distracted them with games and Brad taught them how to play Stingbee, which caused them to erupt into laughing fits. Soon, however, their mother saw they had made no money and screamed at them to return. She gave us the stink eye and we returned the gesture. They left and quickly returned looking even more desperate. We coerced them into playing more Stingbee and then retreated into Nacho. The next morning we were invited to Santhanam’s house for coffee. 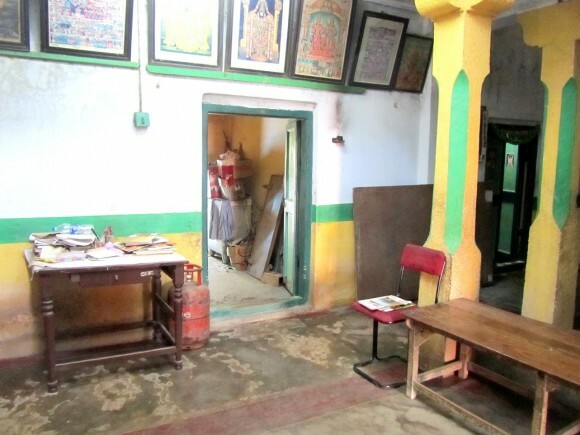 His home was just outside the temple’s wall, set back a little and tucked between two buildings. He saw us from inside and excitedly waved us into the inner courtyard of his home. This courtyard was surrounded on all sides by pillars and doors. The walls were decorated in posters of Hindu gods and goddesses and the back garden was dominated by a deep well and a giant tree. We felt so fortunate to have met Santhanam, and while he didn’t know it, we had met him at the most perfect time. He had shown us a different side of India, one that we both needed to see. We all walked together to the temple. As we started Nacho and prepared to leave, Gopal Krishna emerged from the temple. And with that we were off. Maybe India wouldn’t be so bad after all. Nice story. Glad to hear you got to see a different side of India. Merry Christmas to the both of you! I knew you would eventually meet someone lovely. Like the Monks, these priests were very happy to help you with a safe place to sleep. Wonderful! You have a new friend. That is a wonderful that you found some very welcoming people at the right time….It seems sad the kids need to do the “dirt” work….Some like the kids sound be able to play and have fun…..It’s cool that you played with them and they seemed to have fun. Merry Christmas and safety and peace be with you in our continued travels. Fascinating. I’ll be in that area next week. 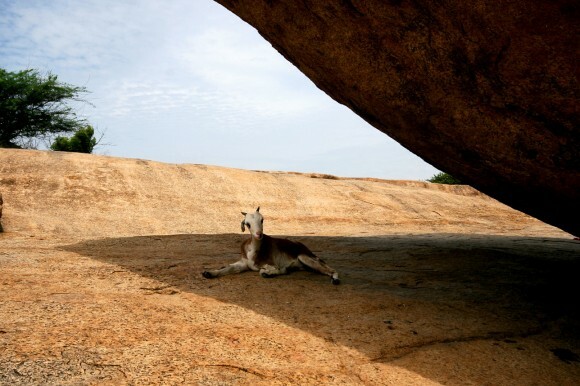 We are visiting important rockcut architecture places in India. Have not yet decided where we’ll end up, as we have a few handlers taking care of our creature comforts. I enjoyed reading your blog and it was only 2% of Chenai what you guys experienced..May be less but absolutely you both had a blast in Chennai. I was born in Chemnai and residing in NY now. Well India is a ghost even for me . it takes lot of energy,Love and Patience to completely understand and accept the culture. Because Indian culture is very ancient. You both certainly experienced culture schock. I did experience culture schock,when I arrived in US for the first time . I made sure that I had a comfortable place to start with and contacts to help me in my new place. I did spend more money to find a safe neighborhood at NYC. Certainly will never try sleeping outdoors when I dont know the place . But it’s worth to experience new environment with safety . As I first trimmer in India it would have been wise to spend a little more dollars and rent a accomodation atleast in a 4 star hotel,where they don’t have Manuel elevators or bug infested beds. Well it’s like me going to NYC and trying to know the culture sleeping next to homeless in a shelter . Yes I will be seeing druggies and dirty people. I am sure some of the motels even in US are bug and cockroach infested. Also yes Chennai has many poor people, I do what ever I can to help,them by giving a little money ..atleast 20-30 rupees …which is what like 50 cents. 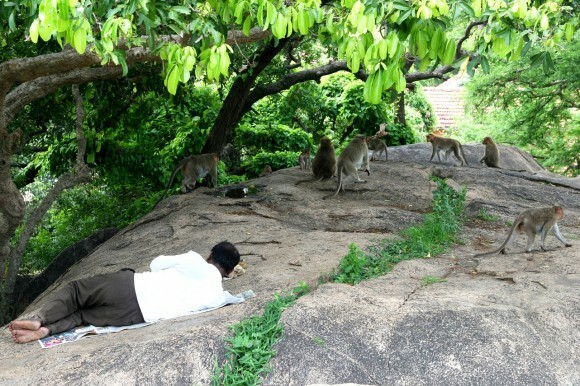 But there are situations where you will be followed by beggars ..it happend to me as well . Chennai has a brighter side as well, it has one of the most wonderful food . It has absolutely wide varieties of Restaurants. Again it all depends because the more we spend the better the quality. I eat both fast food and high end Indian restaurant , a mix of both is always good . A good guide will be the best thing to do for first few times. Chennai has lot more nice things to see and experience . I certainly enjoyed your article . Now, I’m in Thailand with my family. We are in a amazing resort in Phuket. I’m waiting for you in France. I hope that you like India ! I am glad you finally got to experience a very spiritual side of India—I am always fascinated by the Hindu practices. And I am relieved you have Ganesha, the god of travel, with you. That makes a mom breathe easily!